Play Deco Diamonds Slot Online with 500 Free Spins! Deco Diamonds is a 5 reels, 9 paylines Online Slot Game by Just For The Win. Deco Diamonds slot has Bonus, Respins, Wild features and an RTP of 96.03%. Deco Diamonds is an exciting game that is playable on mobile, desktop, and tablet devices. The stylish looking game profits from re-spins with bonus wheel and sticky reels where winning about 1,000 x your stake is absolutely possible. Deco Diamonds Slot has a straightforward layout and an amazing well-crafted modern design influenced by the classy of visual art designs. The developers of Deco Diamonds has combined geometric shapes, diamonds, and jazz music with common fruit symbols in a classic way. Furthermore, you only need few Spins to find out the potential and goal of Deco Diamonds online slots. Just For The Win – Deco Diamonds providers was created by a team of game designers, developers, and experts. Currently, the group consists of twenty people. They focus on delivering game content that is fun to play while delivering a unique and exciting gaming experience. Other games offered by the developers include Lucky Links online slot game and Goldwyn´s Fairies slot. Both games display innovative and rewarding features with a lot of entertainment. To play Deco Diamonds slot game visit Roseslots today! Deco Diamonds is a classic-looking and sleek slot with 9 paylines and 5 reels. The reels highlight some notable fruit symbols, like lemons, cherries, peaches, liberty bells, diamonds, and watermelons. The diamond symbol awards 100 times your bet whenever you land a five in the pay line. The symbol can be used as a wild to switch or replace other symbols. You should play this game because of the thrilling special features and highlights where volatility is high (consistent wins during spinning) and re-spins are the core features of the game. Deco Diamonds slot game looks amazing on any mobile, PCs or portable devices running on IOS and Android. So let’s explore the amazing features of Deco Diamonds to discover what makes this Deco Diamond slot so unique! When spinning the reels, you can activate two bonus features. You can trigger the Re-Spin feature if you land on two, three or four symbols. This includes 1 free spin, while reels that contain a Deco Diamonds symbol will stay fixed as all other reels spin. If you land on another Diamond symbol, you will be given an extra re-spin, which may go on till the diamonds are no more on the reels. The bonus wheel is another gratifying feature you may activate while playing the Deco Diamonds Slot. It is triggered when you secure three, four or five diamond symbols. the bonus wheel will come into view when you re-spins, which is played on three levels: diamond, gold, and silver, when you land on three, four or five symbols. 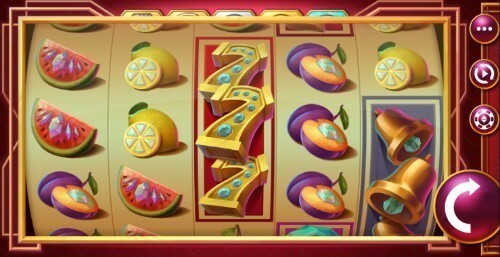 The wheels include multipliers and the greatest prizes are obtainable on the Deco Diamond level. Deco Diamonds casino game displays special features that will keep you playing on and on. Players can play Deco Diamonds slot by staking about 10p to £50 for each spin. Deco diamond online slot has a high volatility and a 96.03% RTP. The most rewarding symbols payouts are exceptionally big, so you will get good payouts when playing the base game. Deco Diamonds slot game graphics and symbols have a clear-cut, simple, and glamorous design with curved reels. Generally, Deco Diamond has a stylish and sophisticated appearance. The background jazzy music reflects the pleasure and fun offered by the Deco Diamond online game. The control panel (located at the right side of the reels) contains information the rules of the game, symbols, and features.